Donating stocks and bonds (often known as appreciated securities) to your church or United Methodist ministry is easy to do and can provide attractive tax benefits. Whether you plan to itemize your charitable contributions, because they exceed the standard deduction, or simply use the standard deduction, the Foundation is perfectly positioned to assist with the transfer and gifting of appreciated security donations to your church. 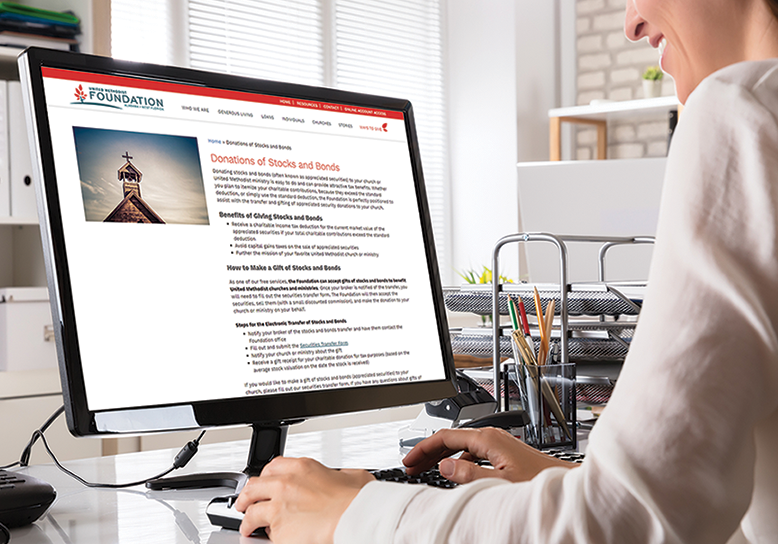 As one of our free services, the Foundation can assist with gifts of stocks and bonds. Once your broker is notified of the transfer, you will need to fill out the securities transfer form. The Foundation will then accept the securities, sell them (with a discounted brokers commission), and make the donation to your church or ministry on your behalf. If you would like to make a gift of stocks and bonds (appreciated securities) to your church, please fill out our securities transfer form. If you have any questions about these or other gift types, please feel free to contact the Foundation office at 334-793-6820 or email us at [email protected].